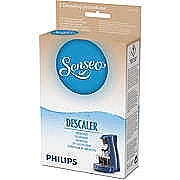 Senseo descaler removes , in 2 descaling procedures, limescale from your Senseo Coffee machine . Regular descaling prolongs the life of your Senseo coffee machine. 4 Bags. Senseo descaler removes limescale so that you can fully enjoy the fresh taste of Senseo coffee. Descale at least every 3 month so this is enough for a whole year.